91 w w w . M o d e r n T i r e D e a l e r . c o m A U T O M O T I V E I N T E L L I G E N C E ( 855 ) 288-3587 autel.com / maxitpms.com Register and update tools for latest coverage © 2018 Autel Intelligent Technology Inc. TS508 98 % VEHICLE COVERAGE PROGRAMMABLE UNIVERSAL TPMS used to determine the sensor's frequency without having to demount the tire. CAUTION: To prevent moisture and contamination from entering the valve stem, the cap used on this valve stem contains an O-ring seal. Retain original valve stem cap for reuse. A regular valve stem cap cannot be used as a substitute. Aer inspecting or adjusting the tire pressure, always reinstall the valve stem cap. is will prevent moisture and dirt entry into the valve stem, which could damage the wheel rim sensor. CAUTION: Any time a sensor is to be reinstalled in a wheel, a new valve stem assembly must be installed to ensure air tight sealing (see Figure 1). Removal 1) Remove the tire and wheel assembly from the vehicle. 2) Demount the tire from the wheel following the tire changer manufacturer's instructions while paying special attention to the following to avoid damaging the pressure sensor: * When breaking the tire bead loose from the wheel rim, avoid using the bead breaker in the area of the sensor. at includes both front and rear beads of the tire. 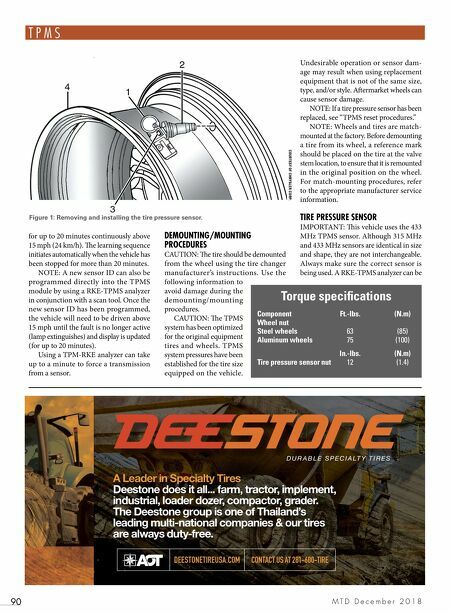 • When preparing to demount the tire from the wheel, carefully insert the mounting/demounting tool 280 degrees +/- 10 degrees from the valve stem, and then proceed to demount the tire from the wheel. Use this process on both the upper and lower tire beads. 3) Remove the sensor to valve stem retainer screw (4) and then remove the sensor (1) from the valve stem (2). See Figure 2. 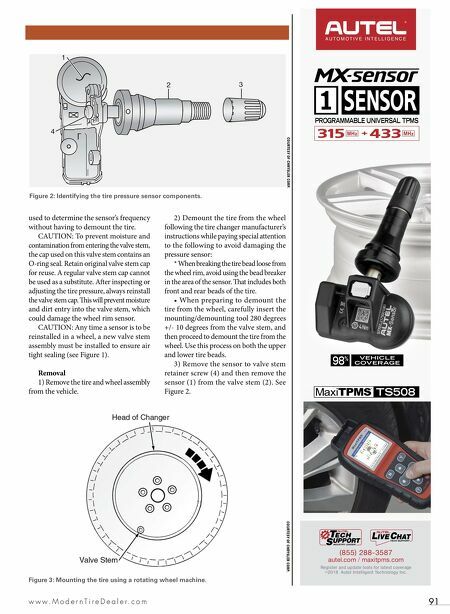 Figure 2: Identifying the tire pressure sensor components. COURTESY OF CHRYSLER CORP. Figure 3: Mounting the tire using a rotating wheel machine. COURTESY OF CHRYSLER CORP.